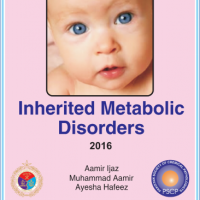 This booklet is a compilation of Clinical Practice Guidelines for Inherited Metabolic Disorders. It is based on day to day experience of dealing with uncommon and relatively lessor known disorders of newborn and infants. A teamwork of Chemical Pathologists, Paediatricians and senior lab technologists have made it possible to diagnosethes IMDs to a higher level than previously done.These Guidelines are by nomeans final words, but will require repeated revisions and modifications in the coming years. This is a joint publication of Armed Forces Institute of’ Pathology (NUMS)’ and’ Pakistan Society’of’Chemical’Pathologist'(PSCP).All!rights are reserved.No part of this booklet may be reproduced without written and explicit prior permission of PSCP. First Edition 2016 This booklet is distributed to the health care providers free of cost and it is NOT for sale.